Princess Peach doesn't get her due. There is far too much attention paid to Mario (and sometimes his brother) in the Mushroom Kingdom. What's that about, huh? Do people think Mario is the only one who knows how to stomp a goomba? And you really think he needs that plumbing experience to crawl down a giant pipe? Anyone could do that. The fact of the matter is, plenty of Mario's supposed greatness comes from him using fancy tricks. Anyone can grab a fire flower to battle a Koopa. And a star? Please! It's not brave rushing into the enemy territory if you're completely invincible. Besides, Mario and Bowser are just such basic bros. Can't they stop fighting over the pretty girl already? Princess Peach is her own woman, and she can choose a man for herself. Although, to be quite honest, the whole kidnapping thing isn't doing Bowser any favors (not to mention that bumpy lizard hide!). 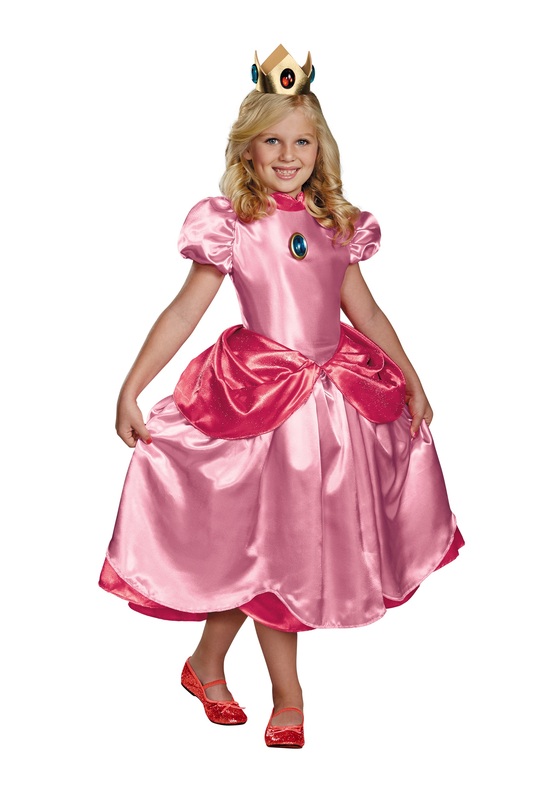 Your little girl is a new kind of Princess Peach. She's not dependent on Italian plumbers or even short little mushroom men. Instead, she's winning the races herself, driving her kart, floating through the air with her powerful jumps and whatever else needs doing. And at the end of the day, she's still a princess. No amount of rough and tumble will take that away. Exactly like your girl, who wants to be a princess and can still hold her own against whoever it is, whether a crazy lizard man or just the boy next door. Let her dress up as another strong princess she's probably already obsessed with: Princess Peach! My daughter is super happy!!!! My 10 year old has been transformed into Princess Peach!!!! She is more than pleased with this costume. She usually wears size 7/8 and this fit her with just a little room but I did a little tuck in the waist. I will always buy from Halloweencostumes.com .....thank you very much!!! !